Last week’s post was about the phenomenon that even though there are generous buffer times, projects often are not completed in time. Most project teams are familiar with the procedure: After a relaxed initial phase, projects become very stressful for all team members. Actual times hardly ever stay below the estimated values. But how can you avoid this problem? 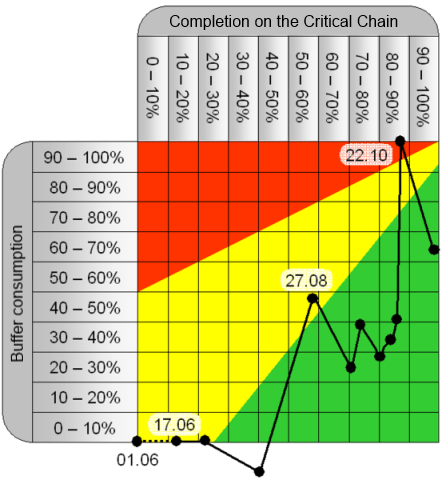 In 1997, the physicist and management consultant Eliyahu Goldratt introduced the Critical Chain into project management to solve this problem. The concept aims to protect the Critical Path from delay, because every leeway leads automatically to an extension of project time. Goldratt predicted that with his concept, project times could be reduced by at least 30 percent. To avoid an extension of project time, managers usually put buffer times between project phases or sub-projects. In many projects, half of the project duration consists of buffer time. The Critical Chain method separates the buffer times from the activities and puts it at the end of the project where it is managed jointly by the entire project team. So, the team members don’t get the impression that they have forever time to finish their work packages and psychological phenomena regarding the procrastination of work are annulled. Then, the buffer time at the end of the project is reduced by 50 percent. These measures are consistent with the recommendations psychologists give to prevent “chronic” procrastination. Time restrictions help to use work time more efficiently. In his experiments, Eliyahu Goldratt reduced the estimated times so drastically that the teams could never be sure if they could complete a task in time. Project controlling is also affected by this method. Both, the progress of the project and buffer time consumption are monitored at the same time. Managers no longer control if milestones are achieved in time, but they “only” monitor the proportion of project progress and buffer consumption. If the project proceeds faster than buffer times are consumed, everything is in the green. If more and more buffer time is consumed without a real project progress, the project is critical – which is marked red in the “temperature curve” image above. The transient area is yellow. Milestones in the sense of clearly defined intermediate project goals have never been an essential part of Goldratt’s concept. Milestones, however, play an important role in project schedules, because they give structure to a project and allow a review of intermediate goals – not only in terms of time and date, but also concerning the quality of the intermediate result. Project phases with clearly defined intermediate goals and fixed due dates enable project managers to keep control of their projects. A project plan without milestones means losing an important managing function. It is also possible that the absence of milestones rather encourages a phenomenon like Parkinson’s Law (see part 1). Project managers have learned from agile software development that regular or even daily team meetings and continuous monitoring of results create great project results. Another problem with Goldratt’s concept is the extremely tight schedule he suggests. In a worst case scenario, team members don’t feel committed to the project plan from the beginning; because they agree that the plan is unrealistic. When team members delay project tasks, it is not always because of the student syndrome, but due to the lack of resources, the pressure or work overload of team members in the project and in their departments. Blaming the team members’ laziness or bad planning for missed deadlines often does not adequately reflect the problem and conceals the actual reasons. Some researchers assume that it is not this specific concept that leads to a reduction of project time by 30 percent, but that the use every systematical project management and monitoring method reduces project times significantly. In that regard, Goldratt’s Critical Chain concept offers several good starting points to improve the adherence to due dates in projects. It does, however, not give a good reason to give up well-known concepts such as milestones if they led to good results in the past. The myth of buffer time in projects – Part 2 - InLoox • Copyright 1999-2019 © InLoox, Inc. All rights reserved.